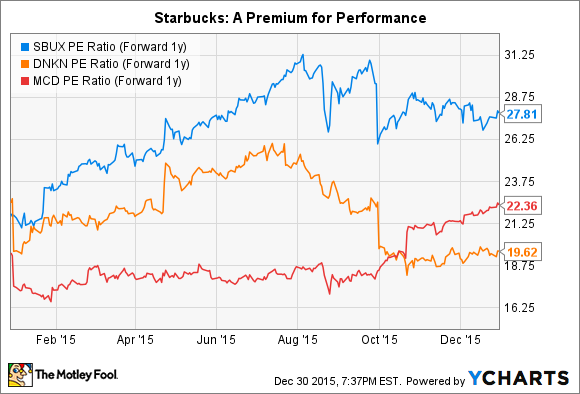 Will 2016 Be Starbucks Corporation's Best Year Yet? Why investors should hesitate to even contemplate this question. Image by Flickr user Jason Cipriani under Creative Commons license. Launch of mobile order and pay. Reached 80 million transactions weekly. $5 billion in "My Starbucks" card loads in 2015. Further diversification into lunch daypart. Ramp-up of Starbucks Reserve premium coffee sales. Extension of Teavana premium tea brand. Consider that most of these are only tied to the company's mainline business. Recently, CEO Howard Schultz mentioned that no other global retailer has been able to parlay a retail food or beverage business like Starbucks' into grocery aisle sales, at the scale or profitability of the company's Consumer Packaged Goods, or CPG, division. This division, which makes up the bulk of Starbuck's "Channel Development" segment, turned over $1.3 billion in sales in fiscal 2015 -- not bad for a side business. "Starbucks' performance throughout fiscal 2015 was outstanding by any standard, metric, or comparison. We are connecting more deeply and more meaningfully with more customers across all day parts than ever before, and we are delivering quarter after quarter of record-breaking financial results, despite the accelerating shift in consumer behavior away from traditional bricks-and-mortar retailing, and despite difficult macroeconomic retail and consumer headwinds that continue to challenge traditional retailers." Getting a handle on what might happen to each of your portfolio holdings during the coming calendar year is a legitimate and necessary exercise. And for those lucky investors who have held "SBUX" shares over the past few years, it's tempting to ask whether this can be Starbucks' best year yet. Yet it may be wise to toss the question of Starbucks' 2016 potential out the window, for two primary reasons. First, the company has maintained momentum in global comparable sales with its celebrated streak of 5%-plus increases over 23 quarters. That's nearly six years of beating its own benchmark of mid-single-digits "comps" growth without fail. Even a slight miss on this front in calendar 2016 would rattle investors significantly. And at the moment, the company's stock is priced to reflect Starbucks' quality of execution and competitive advantages. Just for some grounding, the current one-year forward P/E multiple for consumer-staples stocks in the S&P 500, according to Yardeni Research, is 20.0. So whether placed beside stumbling competitors, or among a broader spectrum of consumer-based companies, Starbucks is commanding a premium in the marketplace. Investors who get caught up recalling the magic of 2015, in which Starbucks' stock soared and it seemed to distance itself from its peers, may find disenchantment if and when the company hits any natural retracement, through business performance or stock price. Some shareholders will cash in their profits at that point and seek another sandlot to play in. But deserters beware! My second point is humbly offered. Of all the stocks I follow, Starbucks is perhaps the least relevant in trying to determine whether the next year will bring the utmost of fortune. That's because, if you sift through all the high quality companies which say they're playing a long game -- and this management team is no exception; they say so, literally -- the global coffee juggernaut stands out. Its executives both truly believe that the organization's investments will have an extended payback period for shareholders, and they've built a track record of delivering the same. Perhaps it's because Starbucks' customer base swarms with repeat visitors, either through an experiential love or caffeine addiction, and building on this base isn't rocket science, once you focus resources on employees, technology, and business execution. Whatever the case, as I wrote recently, Starbucks exhibits a kind of aggression about the future. Excepting unanticipated external factors, it's better for shareholders to worry about other stocks in their portfolios for 2016. For Starbucks, look further ahead.